We didn't hold out too much hope for this rock lost in the middle of the ocean. Yet we spent 4 very enjoyable days there! It was the middle of August, and time for us to cross the Indian Ocean, heading for the port of Richards Bay in South Africa. There was no way that we were going to head home through the Gulf of Aden and the Red Sea. In those areas there had been a recent rise in acts of piracy. So we chose the southern route home, via the Cape of Good Hope. We were pleased with this route which has now become our direction of choice. We left Bali and Indonesia, having stocked up on supplies and with the diesel tanks full. Before us was a vast expanse of ocean with a rather lively reputation, and a few islands to break things up on our south westerly route. Our first stopover was Christmas Island. It's a surprising little coral outcrop which is an Australian territory, situated 1,600 miles from Perth and no less than 930 miles from Australia's North West Cape. The island is 12 miles long and 11 wide. The only village on the island is Flying Fish Cove. The coastline is mainly made up of steep cliffs, and beaches are rare. The population is around 1,200 (not counting the 1,000 or so who were being held in migrant detention camps when we were there), made up mainly of Chinese, Malaysians, Australians and British. There is a Buddhist temple, a mosque (there are some Iranians, Iraqis and Afghans), and an Anglican church. The first record of any activity on the island goes back to 1888, when two British men, George Clunies-Ross and John Murray were granted a concession to exploit certain areas of the island. Murray's analysis of the rock had shown that it was almost entirely made up of richly concentrated phosphates. Work began properly in 1897 with the creation of the Christmas Island Phosphate Company. Today, phosphate extraction is still the island's biggest industry. 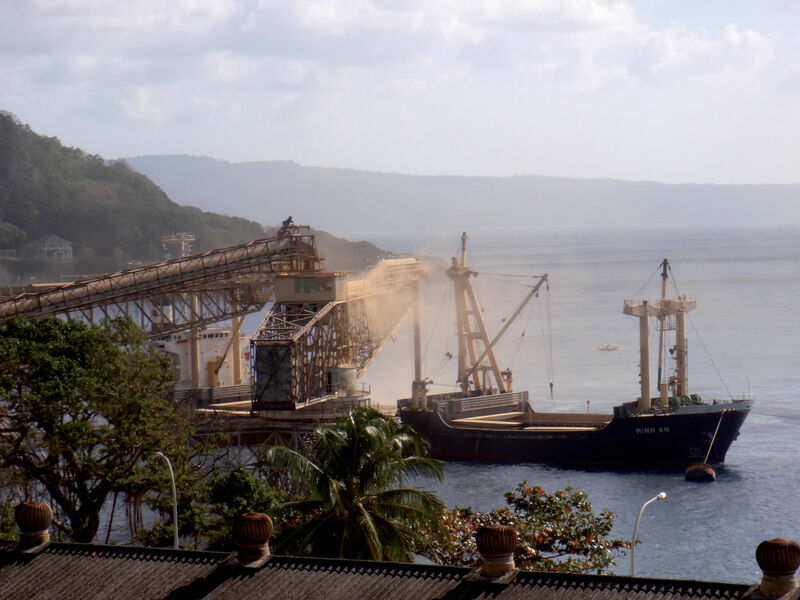 Since 1991, the mines have been run by a company which belongs to the Union of Christmas Island Workers. Flying Fish Cove bay is full of all the installations necessary for tankers to come and load up with Christmas Island phosphates. In the open cast mines, hordes of Caterpillar machines busily extract the precious fertilizer, while on the gravel roads of the island's interior, giant trucks thunder along, taking the phosphate to the port.